The kids next door brought over a plate of delicious Mexican-style barbeque tonight courtesy of their Papa who’d cooked it. I invited them to come back after dinner to join me in the studio. Now that they’re a little older (2nd grade and 6th grade) I decided to let them try acrylics instead of just watercolor. I covered the table, put out the supplies, including gloves for each of them (I get Costco’s “Nitrile Exam Gloves” in quantity). Then I turned on some music and went to my drawing table to work on this little sketch. The next time I checked on them, Y had painted my cat (I mean a picture of my cat), a rainbow (standard little girl stuff) and then made a paper airplane which she was painting while E was decorating a little wooden car he’d made in school. They both made Father’s day and birthday cards for their dad too. They really liked the acrylics since they were brighter and bolder than the watercolor, but what a mess! Fortunately kids, floor and furniture cleaned up easily. Pentel Pocket Brush Pen to draw, then watercolor and then some Schmincke Chinese White to tone down some of the shadows. I’d be happier if I’d stopped before it need to be toned down. This is in my 6×8″ handmade sketchbook on Fabriano Artistico hot press paper. This is a very fresh little study (and I’m not actually trying to be clever! :). Fo a long, long time I’ve wanted to do an ink-and-brush sketch with watercolour added. Maybe I’ll actually try one this weekend, with you jogging my memory. Now, what’s for dinner…? 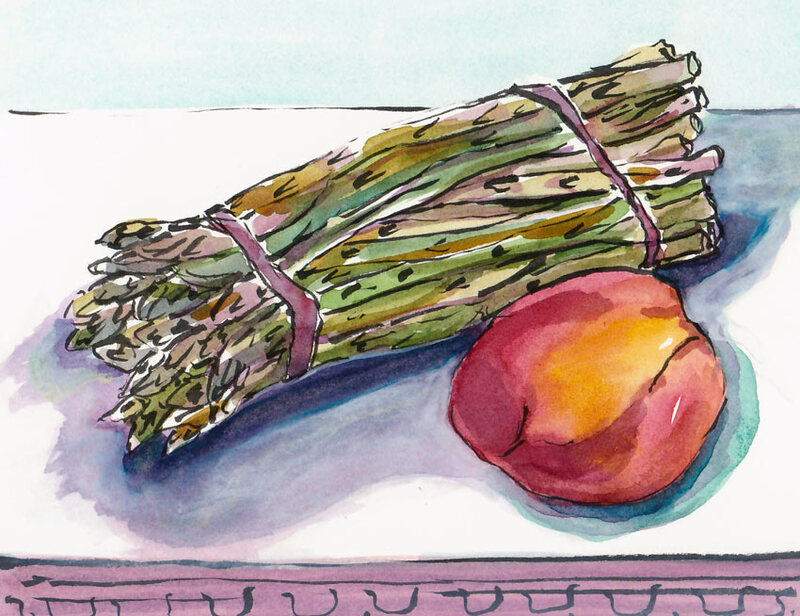 Ahhh, Asparagus and peaches – the epitome of spring. Lovely rendering.